Clyde defender Michael Oliver has unfinished business to attend to after signing on for a second time with the Bully Wee this summer. While the rest of Barry Ferguson’s close season acquisitions settle into their new surroundings, the 26-year-old will feel right at home at Broadwood. Not only did Oliver spend two years at Clyde earlier in his career but he also moves back there on the back of a season in the Lowland League with Cumbernauld Colts who are also based there. Oliver’s first spell at Clyde was cruelly cut short by injury. Now he’s delighted to have ben offered an opportunity to make up for lost time. He said: “Coming back to Clyde gives me the chance to go and play and test myself at that level again. “When I was there before I tore anterior cruciate ligament - I did it twice because was trying to come back too quickly the first time - and was out for 16 months. The serious nature of Oliver’s injury could have been a crushing blow to his footballing aspirations at that stage but he was determined to rebuild his career. After leaving Clyde went to top Kirkintilloch amateur side Harestanes and captained them to victory in the Scottish Cup Amateur Cup in 2015 before moving on to a Cumbernauld Colts side preparing for their first ever Lowland League campaign. He played a key role as Colts finished the campaign in an impressive fourth place. He said: “I really enjoyed my year at Colts and thought we did really well. “I had played against the top Lowland League teams like East Kilbride and Spartans in friendlies before so I knew about about the standard there but wasn’t sure about the rest of the league. “But once we had played everybody we had a better idea of what we were up against and I thought we did really well. Oliver is also relishing the chance to learn from Clyde boss Barry Ferguson and feed off the experience he has from a career at the top level with club and country. And he’s already been impressed with the type of training drills put in place by the former Rangers and Scotland skipper. Oliver said: ““He’s been great and trainng has been brilliant so far. He’s hard but he’s very fair with the players and knows what they want. “He’s someone who has played at the very highest level so you have to listen to him and respect what he has to say. As they did last year Clyde go into the campaign as the bookies’ favourites to lift the League Two title and Oliver is hopeful they can justify that tag this time round. After missing the opening two Betfred Cup games, which both ended in narrow defeats against higher level opposition. Oliver played in the wins over Berwick Rangers and Albion Rovers. 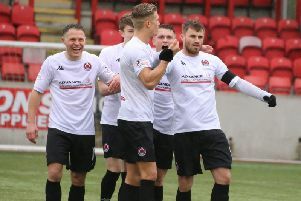 And he believes Clyde’s form in the new-look League Cup format which honed their preparations for the new season can give them momentum going into the league campaign which kicks off against Montrose at Broadwood on Saturday. He said: “I thought we played very well against Berwick and should have won the game in normal time, but we managed to win on penalties to get the bonus point. “Albion Rovers are a really good side so to go there and win was another performance. “Even the games we lost against Kilmarnock and Morton, particularly against Kilmnarnock, we have played well and can take confidence from those games going into the league. “The manager has brough tin a lot of good signings. Meanwhile Oliver will be hoping to play his part in keeping the goals out at the other end and completing his fight back from that cruciate injury with a title triumph.